How is strategy defined today? Why is strategy difficult to define? 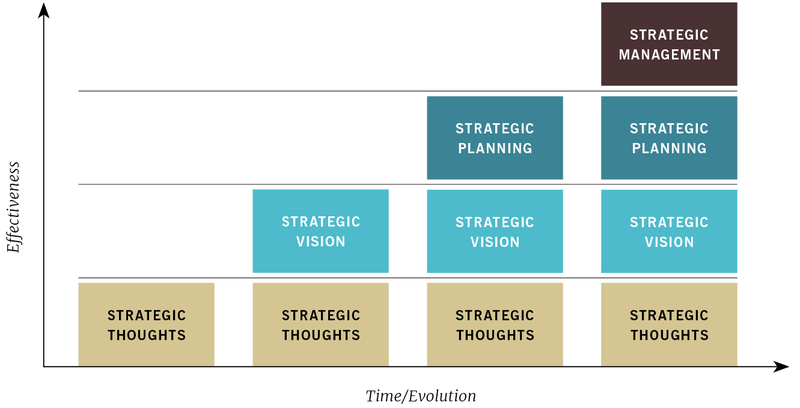 What are the stages of strategic thinking within a company? Our objective is to provide an effective definition of business strategy. 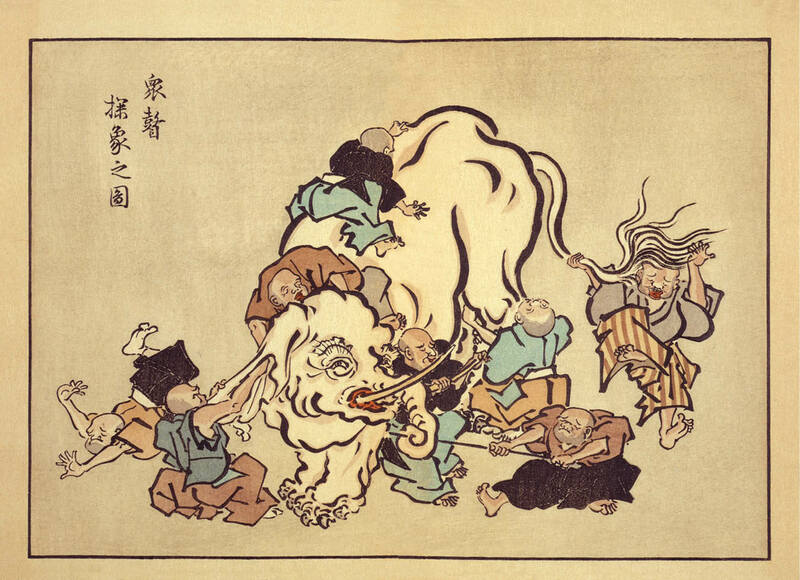 “Blind monks examining an elephant,” an 1888 ukiyo-e print by Hanabusa Itchō. Ask any executive what strategy is and you will definitely get an answer. The problem is, you will rarely get the same answer. Even if the answer sounds the same at the 100,000-foot level, the definitions rapidly diverge as you delve a bit deeper. In fact, hearing executives define strategy is akin to the story of the blind men describing an elephant, each based on their individual perspective. In the story, one blind man feels the sharp features of the tusk and says the elephant is like a spear. Another feels the strong flat side and says the elephant is a like a wall. For another, the wriggling of the trunk compels him to declare it is like a snake. You get the idea. In every case, the blind men are correct in their individual descriptions, but totally wrong in their conclusion as a whole. Much like the story of the blind men describing that elephant, the “strategic definitions” you receive from executives will likely have as many variations as the number of executives you ask. The marketing executive will describe the strategy in terms of markets and pricing. The development executive will offer you technology as the basis for the strategy. The sales executive might propose the strategy in terms of market share and revenue growth. The CFO will talk about stock price and shareholder value. 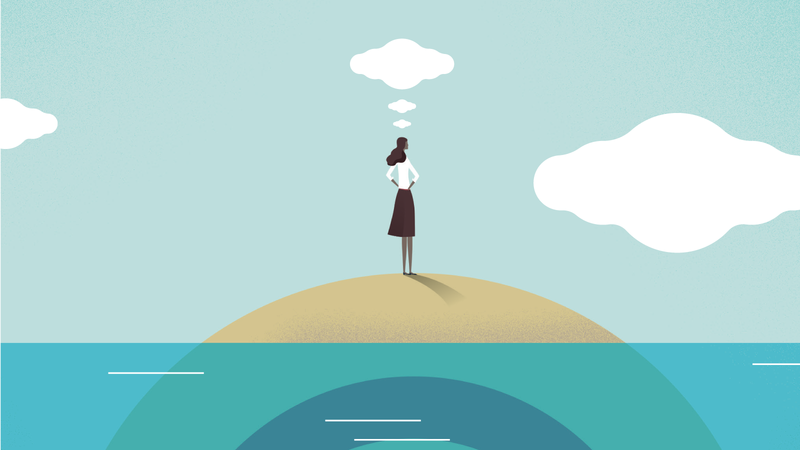 It is the responsibility of the chief executive officer—who, by definition, should also serve the role of chief strategy officer—to aggregate and assimilate these different perspectives into the company business strategy. How often this actually happens is a different subject altogether. The word “strategy” comes from the Latin term “stratego,” meaning “the general’s art.” It refers to military conflict before planes, satellites, and instantaneous communication. Then, the general had to study the landscape where the battle was to take place. The general had to “envision” how the battle would evolve and create appropriate plans involving terrain and resources. It involved anticipation, action, and adaptation over and over throughout the battle. The “science” was in the military methods; the “art” was in seeing future events. As with the example of the blind men and the elephant, many executives’ view on strategy is heavily influenced by their functional perspective. They tend to see through a lens crafted over years and years of looking at business in a particular way, influenced by the role that they play within the organization. Experience also plays a major role in how an executive defines strategy. This includes what strategic methodologies an executive has been exposed to in previous organizations. In some organizations, strategy just sort of happens. In others, it’s a rigid process with little deviation. Consequently, as critically important as strategy is to an organization, it is often the result of an amalgamation of functional bias, eclectic thoughts, inconsistent processes, and personalities. Any survey would reveal a broad range of strategic approaches and, not surprisingly, different levels of strategic success. In other words, when it comes to business strategy, once you’ve seen one business strategy—you’ve seen one business strategy. Finally, in this day and age of “high-tech home runs” where an organization develops one unique product or service and has a successful run, strategy has been ignored. There are valid cases of “no-strategy successes,” but the business highway is littered with thousands of organizations that died because they couldn’t find that one home run and they ignored strategy. These are all admirable and certainly desirable results of a good strategy. But that is all they are: the results or effects of a good strategy. We return to the question of what makes a good strategy—i.e., the “causes” that “effect” those desired results. For a strategy to be competitive, it needs to be measured against a baseline. In other words, saying your company is “competitive” implies it is being measured against something else. In the context of business strategy, this type of strategic analysis requires four components: market, customers, competitors, and solution offering (e.g., product, services, technology). Any successful strategy must be defined in terms of these factors. Obviously, the greatest strategic direction for a company has no value if it cannot be implemented. A strategy may define a clearly attractive marketplace position, but the company may simply be incapable of achieving it for various reasons: capital, human resources (capacity, capability, and/or commitment), technological prowess, organizational processes, time frame, etc. In an economic environment with decreasing availability of capital, the old adage of “play the best you can with the cards you were given” takes on a whole new meaning. Additionally, for a strategy to be effectively implemented, it must be capable of being communicated in a manner that allows the organization to understand it, rally behind it, and act on it at all levels. 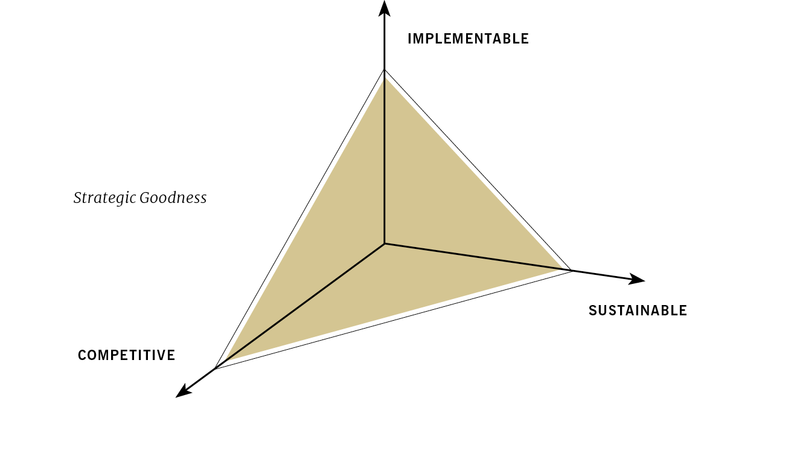 In order for a strategy to be sustainable, there are two key requirements. First, the market must be sustainable for a period of time sufficient to make the company successful. There are plenty of examples of companies that were successful briefly, only to have their marketplace shift. The key is appropriate marketplace segmentation. Second, and equally important, is the need for effective processes and intellectual bandwidth to constantly examine the strategy and make corrections as required. Assumptions are a necessary part of business. If they gravitate to being sacrosanct, however, they are also the number one reason for failure among historically successful businesses. As one can imagine, there are trade-offs in addressing these strategic elements. That is, a less competitive strategy is easier to implement, but may not be as sustainable. This “balance” must be optimized for a truly effective and successful strategy. In this stage, there are general impressions about the future of the market and products/services. They are not well articulated and there are only informal linkages, at best, to major company initiatives. In this stage, the company has an articulated vision of the future that addresses markets, products, customers, and competitors. However, linkages between strategy and major initiatives are still informal. Traditionally thought of as the desired state of strategy within a company, this stage is characterized by quantifiable strategic objectives and goals. There is also a process for allocating resources based on strategy. This is the stage where successful companies want to be. Strategy is part of a day-to-day comprehensive management process in which strategic information is identified and stored for later processing; strategy addresses cultural requirements; resource allocation is directly linked to the ROI of objectives and goals; and the practice of challenging assumptions is institutionalized within the organization. There is a vast gulf in the ability to create and deploy successful business strategy between those executives who can execute the “mechanics” of strategy versus those who also have the ability to “think strategically.” That is why great strategies are a blend of science and art, analytics and insight, right brain and left brain. This is not a trivial distinction. Business strategy consists of the defined organization vision, processes, and resources that form the basis of successful competition within both current and future marketplaces. A clear understanding of how the company will compete in that future marketplace. The operating guidelines of the organization. Major strategic aspirations that create competitiveness. To continually manage, challenge, and refine the strategy. This article has been about “defining” strategy. The next logical step for the executive is now to learn how to “develop” and then eventually “manage” strategy. Business strategy is a complex, multi-dimensional subject that is critically important for any successful organization. It would seem the need to provide more regimented attention is more important today than ever before.